Horizontal wall mount bracket 1 1/2 inch projection. For 1" diameter Valencia rods. Some colors are more than base price. Contemporary collection from Altran, steel finish and acrylic. Acrylic, modern look for any room. Use with standard curtains, loop top curtains, or eyelet curtains. Use with tab top curtains, tie top curtains, eyelet curtains or pinch pleat draperies. Contemporary collection from Altran. Kirsh drapery rods. Curtain rod hardware for the budget minded. Double drapery rods. Two way draw, includes 2 support brackets and 30 slides for connecting your fabric. This set includes a two way draw traverse rod and a plain curtain rod for a combination drapery and curtain window treatment. Empire Traverse Rods are made from heavy guage steel with a baked enamel finish. Quick mounting drop in brackets and supports that fit over rod are included. Cord guide is included to hold cord to wall. The Empire rod has self lubricating pulleys and slides. Polyester cor and continuous lacing for use at either end or to convert to one way draw. Extra long drapery rod, includes 47 slides and 5 support brackets. Clearance 2 to 3 inches, return 3.5 to 4.5 inches. One way right. Superfine traverse rods. Best Quality drapery hardware rods you can buy for the money. Sizes over 94 inches will have an oversize freight charge manually added. Notification of amount will be emailed for approval before shipping. Kirsch traverse rods 3235 will cover that wide window, up to 180 inches. Superfine Traverse Rods include drop in brackets, supports and cord tension pulley for installation. Made from heavy gauge steel with a baked enamel finish. Exclusive Kirlon on all sliding surfaces. Push in brackets and extension plates are available as an option. Only the finest pulley sets are used. Strong and durable with a slide gate for easy removal of extra slides. Long wearing, stretch resistant polyester cord and continuous lacing for use at either end or to convert to a one way draw. One way draw, extends from 100 to 180 inches. Superfine Traverse Rods include drop in brackets, supports and cord tension pulley for installation. Includes 11 slides and 2 support brackets. Clearance 2 to 3 inches, return 3.5 to 4.5 inches. Made from heavy gage steel with a baked enamel finish. Exclusive Kirlon on all sliding surfaces. Push in brackets and extension plates are available as an option. Only the finest pulley sets are used. Strong and durable with a slide gate for easy removal of extra slides. Long wearing, stretch resistant polyester cord and continuous lacing for use at either end or to convert to a one way draw. One way draw, extends from 30 to 48 inches. 3236-025: Superfine one way left extra long curtain rod 100"-180"
White finish, includes 38 slides, brackets and 2 center supports. Two way draw, also known as center open. Kirsch drapery rods, Superfine Traverse rod set include drop in brackets, supports and cord tension pulley for installation. Made from heavy gauge steel with a baked enamel finish. Exclusive Kirlon on all sliding surfaces. Push in brackets and extension plates are available as an option. Only the finest pulley sets are used. Strong and durable with a slide gate for easy removal of extra slides. Long wearing, stretch resistant polyester cord and continuous lacing for use at either end or to convert to a one way draw. Two way draw, extends from 86 to 150 inches. Select wood curtain rod pole 3" diameter, 12 feet long. Available in 4,6,8,12 and 16 foot lengths. Ten colors to select from plus unfinished. Base Price is for unfinished rods. Colors will show price in the cart. Note: 12' and 16' rods have to be shipped by truck. Buckingham wood curtain rods are custom made by Kirsch in a wide varity of finishes. Wood pole diameters include 1 3/8", 2" and 3". All diameters come in 4', 6', 8' lengths and all but the 3" come in 12' lengths. Thirty finial designs, brackets and rings are available in matching colors. You can also select from a range of scarfholders and holdbacks to complete your design. Buckingham products are custom made and not returnable. Allow about two weeks for completion. Selection from chart below is orginized by rod diameter and the components for these are listed below. The 1 3/8" and 2" user the same finials. Size independent components are list last. Kirsch drapery traverse rods. All rod can be ceiling mount drapery rods or wall mount. Curtain hardware rods by Kirsch. Two way draw Kirsch drapery rod, includes brackets and 10 slides, Extends from 30 to 48 inches. Superfine Traverse Rod is the workhorse for durable installations. See how to install drapery rods in the support section. Superfine Traverse Rods include drop in brackets, supports and cord tension pulley for installation. Made from heavy gauge steel with a baked enamel finish. Exclusive Kirlon on all sliding surfaces. Push in brackets and extension plates are available as an option. Only the finest pulley sets are used. Strong and durable with a slide gate for easy removal of extra slides. Long wearing, stretch resistant polyester cord and continuous lacing for use at either end or to convert to a one way draw. 3305-025: Double curtain rod bracket returns 5.5 and 6.5"
3580-025: Double curtain rod support returns 5.5 to 6.5"
Decorative Adjustable Traverse Rods by Graber come in four styles. All are 1 1/2 inch diameter metal with plastic finials and slides with brass pendants. Sets include mounting hardware. Projection from wall is adjustable from 3 1/2 to 4 1/2 inches and clearance behind the rod is 2 1/2 to 3 1/2 inches. Graber decorative rods come with a two way draw that can be converted to a one way if needed. Pin setting height for decoartive rods with ring slides is 1/2 inch and for decorative rods with plain sildes it is 7/8 inch. Weight limit for rDecorative rods up to 84 inches is 1 1/2 pound per foot, over 84 inches it is one pound per foot. Decorative Adjustable Cafe Rod Sets are available in four styles and include brackets and finials for installation. Three diameters are available, 1 1/2, 3/4 and 7/16 inch. Lengths are available up to 180 inches. Thes can be used with pocket top curtains, tab top curtains, tie top curtains and grommet top curtains. Optional rings can be used for pinch pleat draperies. Bamboo 2" curtain rod is made from natural bamboo. Natural products are mother nature's way of giving us our own unique design as no two are alike. Natural pits, discoloration and pole curves are part of the enhancements to the bamboo design that gives us our own custom look. The 9600 series Kirsch Architrac system is excellent for privacy curtains in hospital and extended care facilities or other facilities that require privacy sections. This cubical track line has hardware to suspend from ceiling and wheeled carriers with hooks for attaching curtain. This system measures 29/32" wide by 11/16" high and is made of .050 extruded aluminum with an anodized aluminum finish. This track can be bent or curved to fit in corner, bay or bow style windows and allow complete operation around the 14 " radius bends. Wheeled carriers are used with the 9600 track and available with eyelet or eyelet with hook carriers for smooth operation. Extra long curtain rods traverse and plain combination 100-180"
Extra long drapery rods. Superfine curtain drapery rod. This double drapery rods set includes a two way traverse rod and a plain drop in rod for a combination window curtain treatment. Sizes over 94 inches will have an oversize freight charge manually added. Notification of amount will be emailed for approval before shipping. Our hundred years of product expertise and unwavering commitment to quality confirm Kirsch's preeminence in basic drapery hardware. Consider the patented Curtain rods, or continental wide pocket rod with spring tension and shower option, or ready made superfine collection of traverse rods, the industry benchmark available in drop in and push in styles up to 300" wide. The list of innovations is long: and all of them designed to provide elegant solutions to modern window treatment needs. Regardless the challenge, find the answer with Kirsch basic drapery hardware. 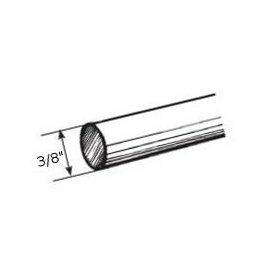 3265-025: Combination double curtain rod set 48-86"
3267-025: Combination double curtain rod set 86" to 150"
Select wood decorative traverse rod with 3" wood facial over select supreme traverse rod. Ten colors to select from plus unfinished. Finials optional, search select wood. Base Price is for unfinished rods. Colors will show price in the cart. Price includes 3.5 carriers per foot and standard wall brackets that have 3" to 4" returns. Note: Rods over 100" have to be shipped by truck..